Many Tamils and Muslims in Mannar fled the homeland at the height of the war, with the hope of returning if a conducive environment- free of violence and warfare- would be created for peaceful coexistence. Around 220 families from Silavathurai, Musali division, Mannar District, were also forced to flee the area during the conflict. When they returned to their lands in 2009, the number of families had risen to 750. As they returned to Silavathurai, eagerly hoping to rebuild their lives, they witnessed a Navy camp that takes up the whole space- spanning 36 acres- where they used to live. Their relentless struggle included protests, petitions and discussions, yet, the lands are still occupied by Government forces, despite pledges to return them to the rightful owners. Of the 750 families who returned in 2009, only 120 families have legitimate deeds for their lands. Others claim that they have lost the documents while fleeing to escape from the intense fighting. Around 350 families have been provided with lands about one kilometer away from their original lands while 275 families of the 350 have received financial support from the state and Indian funded projects to build houses. Around 75 families are temporarily resettled in coconut thatch roofed houses. Around 400 families have neither land nor temporary resettlement. However, all 750 families demand their original lands which are currently occupied by the Sri Lanka Navy. “We will continue with our fight even though we have received alternate lands. We want them to return our original lands,” Chairman of Land Rescue Front of Silavathurai M.S. Taj Mohomed told the Daily Mirror. “We had all facilities before, but now we have nothing,” he complained. 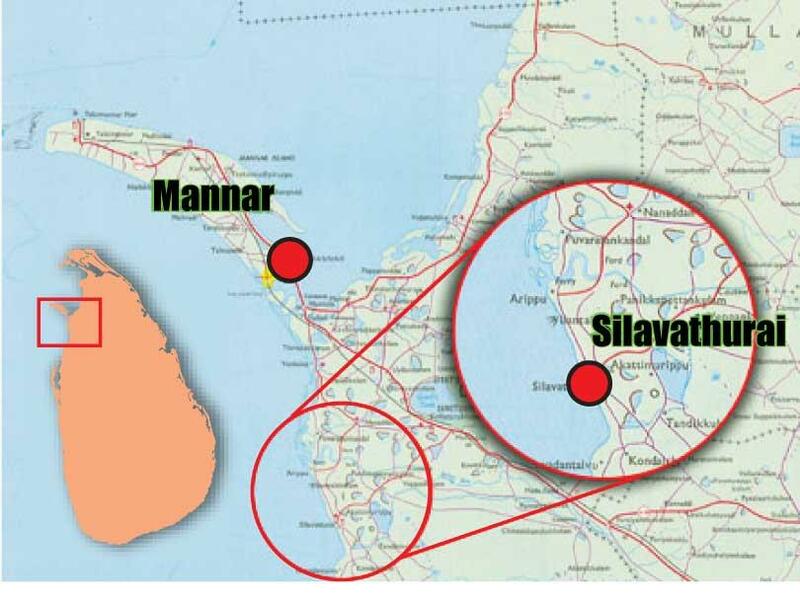 Silavathurai is a little village by the coast, 40 km southwest of Mannar in the Musali division. Aquamarine waters in Silavathurai are so clear that the fish swimming within are visible to the naked eye. The beauty of Mannar beaches is almost unthinkable and it is no match compared to what’s on offer in Colombo or Down South beaches. Pearl fishing had been an active trade in the areas, connecting the region to the outside world. Later on, Muslims and Tamils in the area gradually turned to paddy cultivation and farming. After their return to the homeland, they found it impossible to engage in their previous livelihoods. “Our people are facing many problems in terms of employment. Fishing is no longer possible because the Navy is everywhere and we feel restricted. At the time we had to leave, we had farms in houses too. Now we are left with no option other than engaging in manual labour to provide three meals for our children,” Taj Mohomed said. The Northern and Eastern provinces have reported the highest levels of unemployment in the country, with unemployment rates at 7.7 percent and 6 percent respectively. Unemployment figures among women in North (15.5%) and East (13%) are over twice the national female unemployment rate (6.5 %). “When our children go to school, when we go to the mosque for prayers, to the burial site for a funeral, or even when we just walk to the nearest grocery, a sight of a Navy camp or security officers is unavoidable,” Rizvana said. According to her, the area of the land possess historical importance and consists of residential lands, houses, a mosque, a Hindu Kovil, shops and several Government offices. Refuting claims that security officers harass them in any manner, Rizvana said the residents of the area don’t feel there is freedom of movement when compared to the environment which existed before the war. “When we are at home, we should feel it. If we feel we are being monitored by someone and when we see armed men in uniform every single day, we don’t feel there is liberty,” she said. Residents of Silavathurai who have been protesting for the release of their lands from Navy occupation also complain of threats and intimidation from the armed forces. A group of protesters filed a complaint against the Sri Lanka Navy at the Human Rights Commission (HRCSL) recently, stating that they were being intimidated and photographed by Navy personnel. The protesters appealed for protection from HRCSL. Foreign Minister Tilak Marapana told the UN Human Rights Council (UNHRC) at its recently held 40th session that the remaining lands, which are a necessity in the context of national security, would continue to be held by the security forces, with compensation being paid for privately-owned lands. To know what the stance of the Navy is, the Daily Mirror spoke to the Navy Media Spokesman Lieutenant Commander Isuru Suriyabandara. He said that people in Silavathurai won’t achieve much by protesting. He cited both security concerns and strategic importance as reasons for their reluctance to move out of the area. He said the Silavathurai area is an important strategic location to target illegal drug smugglers and Indian fishermen who illegally enter the Sri Lankan waters. “We have apprehended scores of grams of Kerala Ganja from Silavathurai seas. Even if they ask us to move out of the Navy camp, we cannot do so due to the needs of national security. We have a national responsibility to safeguard the area and the people. If we move out, who will take the responsibility?” asked Lieutenant Commander Isuru Suriyabandara. “The Navy cannot decide on its own about shifting a camp. Currently, we have no plan to move out. Even if it happens someday, it would take a lot of time. Much research and studies have to be done before decisions like these are taken,” he added. However, the distance between the Northwestern Command Headquarters and Naval Institute (SLNS Barana) in Mullikulam and the Silavathurai Navy Camp is just 3.7 km. Human Rights Watch (HRW) report “Why Can’t We Go Home?” Military Occupation of Land in Sri Lanka released on October 9, 2018, stated that despite claims by the Sri Lankan military that they are holding on to land in the war-torn north and east for national security, the real interest is commercial gain. The 80-page report said “the use of the land for tourism or agriculture points to the real interest rooted in commercial gain. In at least four sites included in this report, the land occupied by the military under the pretext of national security is being utilised for commercial purposes.” HRW claimed that many acres of land previously owned by villagers had been converted by the military for commercial endeavours. The Daily Mirror carried an article in 2017 regarding the land issue in Panama, Ampara following a visit by the author and we witnessed tourist cabanas and lagoons built by the military forces in residential and cultivation lands belonging to the people of Ulpassa, Egodayaya, and Horakanda; areas they used to live in before the war. When the Daily Mirror asked the Navy about the number of lands which are used for commercial purposes by the Navy, we received a negative response. The Navy said it is almost impossible to issue such information and specifically asked what we could do with such information. 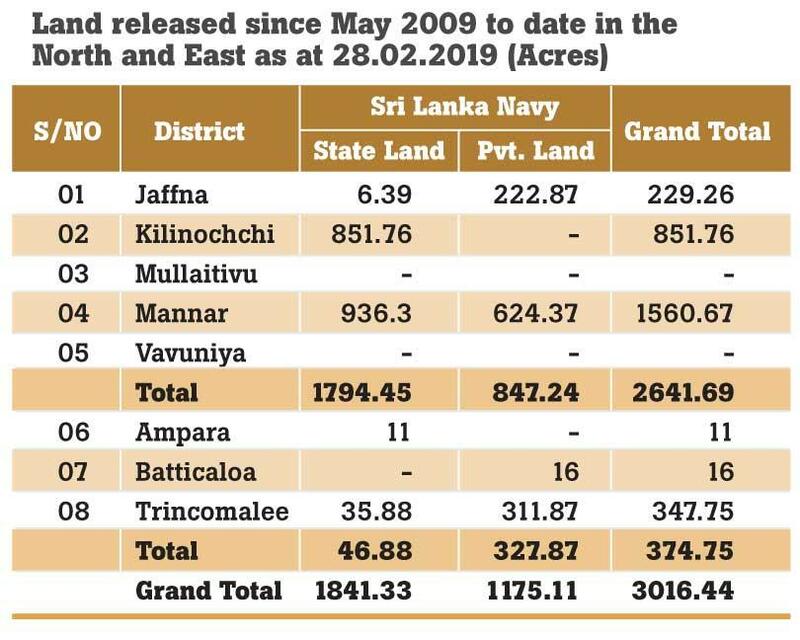 When the Daily Mirror asked for the information from Sri Lanka Navy about the number of acres of land still occupied by the Navy, they refused to provide the information citing national concerns. Even the Department of Provincial Land Commissioner of Northern Provincial Council failed to provide the information this newspaper required. Meanwhile, we spoke to the Industry & Commerce, Resettlement of Protracted Displaced Persons, Co-operative Development and Vocational Training & Skills Development Minister Rishad Bathiudeen who has been heavily criticised over the alleged resettlement of Muslims in lands belonging to the Wilpattu Forest Reserve. The minister said that refusing to return the main land of the only Muslim town in Northern Province is unfair. “Silavathurai is akin to the capital of Muslim community in North. This land, where the Navy has built the camp, is in the centre of the town. 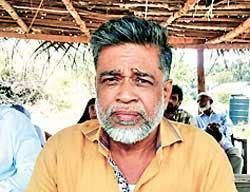 Holding this land with hatred is unacceptable,” he said. He stressed that justice has to be meted out to the people who had been patiently waiting for the return of their lands despite having the capacity to take this issue to Geneva. Responding to the Navy’s stance about security concerns and ongoing smuggling activities in Silavathurai, Minister Bathiudeen said the Navy has the Mullikulam Navy Base which is just 3 km away from this problematic land to carry out their security operations. Sri Lanka after the conflict is facing challenges in returning property to those forced out of their lands, caused by a loss of records, overlapping claims and a lack of necessary institutional frameworks. This land issue is not limited to Silavathurai, but is a common complaint coming from all over Northern and Eastern provinces. 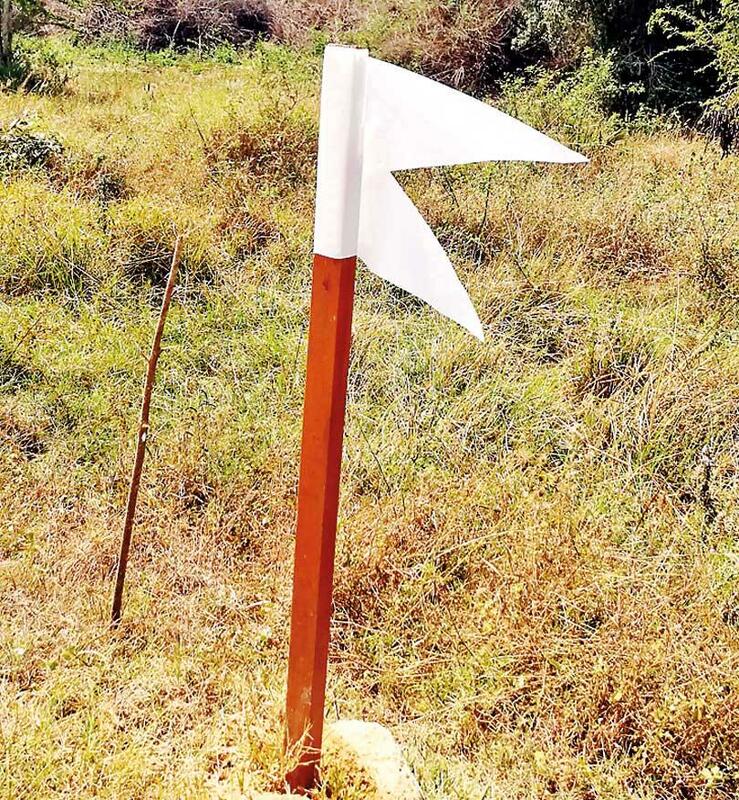 Dozens of families in Mullikulam, a small village in the Musali division on the Marichukatty-Puttalam road at northern edge of the Wilpattu jungles, are still fighting to get their original lands back from the military forces. The authorities should open their eyes at the plight of scores of Catholic families who lived in Mullikulam St. Mary’s Church area. They are now not given permission to return to their houses. The status of return of their lands in Mullikulam too remains uncertain, due to the Navy having established their Northwestern Command Headquarters and Naval Institute (SLNS Barana) at Mullikulam. When we saw the golden sand and the wonderful beaches in Mannar, the word came to our minds was ‘paradise’ but in reality the place had been ignored and abandoned. The people’s lives of Silavathurai and Mullikulam too can be improved. First and foremost, the people’s lands should be given back and the state should support them regardless of their race or religion to uplift their lives. The development in the lives of people ultimately positively impacts the state and country too.